Sandwalk: Introduction to "The Curious Disconnect"
Introduction to "The Curious Disconnect"
This is the first of a series of postings by a guest blogger, Arlin Stoltzfus. Arlin has some important ideas about modern evolutionary theory and I'm happy to give him a chance to put them on Sandwalk. 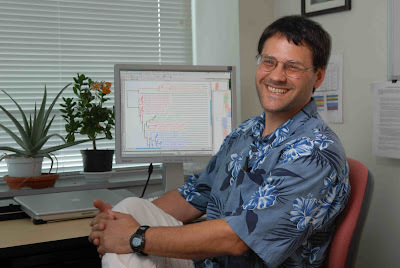 Arlin Stoltzfus is a computational biologist with a background in bacterial population genetics and molecular evolution. He is a Research Biologist at the National Institute of Standards and Technology (NIST), and a Fellow of the Center for Advanced Research in Biotechnology. Much of his current work focuses on software and databases for evolutionary analysis, in collaboration with an international group of peers interested in improving interoperability. He also does basic research on evolution, and has contributed to our understanding of the history of introns, the origins of complexity, and the role of mutation in evolution. When he isn't doing science or spending time with family, his favorite diversions are playing the piano, bicycling, and martial arts. This is a longish introduction to a series of postings that will be released over the next 6 months or so. A version of this document with corrections and updated links will be maintained at http://www.molevol.org/files/cdblog/intro.html. The title of this series—The Curious Disconnect—comes from a 2002 article by eminent evolutionary geneticist Allen Orr (Orr 2002), who had broken new ground by developing predictive models of adaptation, and was reflecting on why such models weren't developed long ago, referring to "a curious disconnect between the verbal theory that sits at the heart of neo-Darwinism and the mathematical content of most evolutionary genetics". That struck a chord with me. Since the 1990s, I had struggled with a "disconnect" that emerged while I was digesting a think-piece by paleontologists Elisabeth Vrba and Niles Eldredge (Vrba and Eldredge 1984). Among other things, Vrba & Eldredge made the startling suggestion that a key theme of "evo-devo" was that "bias in the introduction of phenotypic variation may be more important to directional phenotypic evolution than sorting by selection". By 1999 when Constructive Neutral Evolution appeared (Stoltfus 1999), my thinking had shifted noticeably toward emphasizing 1) the mechanistic distinction between the process of introducing variants and the (separate, subsequent) process of reproductive sorting (selection and drift), and 2) a research program of accounting for non-randomness (in evolution) by invoking both bias in the introduction process, and bias in the sorting process. This way of thinking suggested that mutational-developmental bias in the introduction of variation was a general cause of evolutionary bias or direction. That contradicted two things I knew about evolutionary thinking. First, I knew that the notion of "internal" variational causes of direction, called "orthogenesis", had been rejected as a heresy. Second, I knew that, among contemporary researchers, mutation bias was not seen as a general bias on the course of evolution, but as a special aspect of neutral evolution, incompatible with selection. I was confident that Vrba & Eldredge were headed in the right direction, but when I surveyed the theoretical literature, I could not find proof. Instead, Fisher, Haldane and Wright—the canonical founders of theoretical population genetics—all argued against a causal link between mutation and the direction of evolution, on the grounds that "mutation pressure" would be overcome by opposing "selection pressure", as in their mutation-selection balance models. Later, when "neutral" thinking became popular, this "opposing pressures" schema was interpreted to mean that mutation-biased evolution is possible, but only when selection "pressure" is absent. This was the conventional wisdom, but I knew it was wrong. Thus, a few years later, when Lev Yampolsky and I (2001) used computer simulations to demonstrate that bias (mutational or developmental) in the introduction of variation is a possible cause of direction in neutral or adaptive evolution, we were showing a causal link that is both 1) a basic principle of population genetics, and 2) a heresy at odds with the professed views of the founders of population genetics. What a "disconnect"! Indeed, the first premise of this blog series is that the "disconnects" in evolutionary biology are not just curiosities, but important challenges. Eventually I came to see these two "disconnects" as parts of the same syndrome. The retarded development of what Orr sees as predictive models of "Darwinian adaptation" is due mainly to the fact that the models are not properly Darwinian. These models (like many used in molecular evolution) treat evolutionary change as a recurring origin-fixation process in which new mutant alleles are introduced, and then individually face acceptance or rejection according to a probability function representing the effect of reproductive sorting.1 Our Darwinian ancestors rejected this kind of "lucky mutant" or "mutationist" framework as anti-Darwinian. Instead, they were committed to a view in which adaptation takes place at many loci simultaneously on the basis of infinitesimal variation so abundant that the process does not depend on the rate of new mutations. Given such a view, "evolution" can be reduced to shifting the frequencies of alleles already in the "gene pool". When evolution is redefined in this way, the introduction process disappears and its effects become inaccessible. This explains the retarded development of the Yampolsky-Stoltzfus model. Notice that this is not just a matter of "verbal theory" versus "mathematical content". Vrba & Eldredge had a verbal theory that suggested a way to combine causes, and Yampolsky & Stoltzfus demonstrated its implications formally with computer simulations; Wright, Haldane and Fisher had a verbal theory of combining causes that drew on mathematical treatments of mutation-selection balance. These two conceptions of evolution lead to two different predictions on a major issue. This suggests that there are different theories about the role of variation in evolution, and indeed, there are. Having different theories is not a bad thing. In a healthy scientific discipline, one expects different theories to compete with each other for success in prediction and explanation. The problem is that this healthy sorting-out process isn't happening. The disconnects mentioned above go back generations. The problem is not that we haven't solved them already, but that we are not consciously and openly engaged in solving them. Rather than having a rigorous and decisive debate to resolve these and other troubling issues, we are bogged down in confusion. How did things get so muddled? I have a possible explanation. I don't expect you to believe my explanation just yet, because it depends on a lot of arguments that I have not presented yet. However, I need to present this historical hypothesis anyway to provide a context. The main reason, in my opinion, that the process of science has gone so badly off track in evolutionary biology is the success of the Modern Synthesis.The main reason, in my opinion, that the process of science has gone so badly off track in evolutionary biology is the success of the Modern Synthesis. The Modern Synthesis was simultaneously both a reactionary theory of evolution- lets call it "Darwinism 2.0"- and a progressive socio-political campaign to establish Evolutionary Biology as a discipline with a unifying "modernist" narrative (a claim to subsume all relevant phenomena). The mechanistic secret to Darwinism 1.0 was variation on demand: "altered conditions of life" automatically turn on the flow of variation, producing abundant infinitesimal hereditary fluctuations precisely when (due to the "altered conditions of life") they would be leveraged by selection to build adaptation. Genetics refuted Darwin's theory of fluctuation (along with Lamarck's theory). The "gene pool" theory in Darwinism 2.0 held that Mendelian populations act as dynamic buffers of genetic diversity, so that abundant infinitesimal Mendelian variation is "soaked up like a sponge" and even "maintained", ensuring its constant availability. Thus, in Darwinism 2.0, the evolutionary engine comes with a tank full of fuel that automagically keeps itself full; in Darwinism 1.0, there is no storage tank, but fluctuating variation supplies fuel on demand, directly to the engine. Either way, the abundance of formless infinitesimal "raw materials" ensures that selection may spring into action to build anything, anywhere, anytime. Though the "gene pool" idea was ingenious, no such reconciliation of Darwinism and genetics was necessary. A century ago, upon the discovery of genetics, scientists began moving rapidly toward a fresh and credible framework combining Mendelian genetics with reproductive sorting. While Darwin had rejected a role for "sports" or mutants on the grounds that they violated his principle of natura non facit salta (nature does not make leaps), early geneticists had no such doctrinal allegiances. With minor exceptions, they were ready to follow the evidence wherever it seemed to be leading, happily embracing dramatic saltations, and just as happily embracing tiny increments of change, depending on where the evidence seemed to point. They did not need to reconcile genetics with Darwinism, only with evolution. But that was not enough for some. And that is when we took The Wrong Turn. Within a generation, the leaders of the new discipline of Evolutionary Biology were all marching under a flag of unification—and there was no turning back. In hitching itself to Darwinism 2.0, the newly minted discipline of Evolutionary Biology had mortgaged its future to purchase the theoretical analog of a baroque castle. The proud new owners of this castle were not about to knock down any walls, much less to sell the place for something brighter and more open. Science is driven by ingenuity, but its also driven by our aversion to cognitive dissonance. Uncovering and addressing "disconnects" or contradictions or paradoxes results in consilience, e.g., consilience between our intuitive verbal thinking, our mathematical theories, and our experimental results. Surprises and contradictions invariably emerge in any discipline, and so this process of seeking consilience did not stop just because we underwent a mass conversion to monotheorism. The process continues, not by rejecting inadequate conceptual structures and building new ones, but by treating every challenge as a superficial problem that can be patched up with formless globs of conceptual mud- think of feckless notions like "constraints" or "contingency" or "molecular evolution". "Contingency" is a clumsy attempt to adapt a teleological and deterministic world-view to fit dynamic indeterminism. The notion of "constraints", likewise, is a kludge to adapt an idealized view in which selection chooses from among all that is possible, to fit more closely to the reality that the process of variation renders some possibilities more likely than others. Ideally, we would have a theory that treats variation not as a static precondition, but as a process with kinetics that impose biases on the process of evolution. What we have instead is a concept of "constraint" that, if interpreted literally, is inadequate to cover all but the most extreme cases of variational effects (which typically are not rigid restrictions, but mere quantitative preferences), and if interpreted vaguely enough, can cover anything. Recasting the role of variation in terms of dynamic processes would require major renovations to the baroque castle, and who has time for that? Rather than developing a new view, we have opted for the vagueness and flexibility of "constraints". Likewise, under healthier conditions, "molecular evolution" would have brought down the castle. Remarkably, in the 1970's, the same clique of influential thinkers (Mayr, Simpson, Dobzhansky, et al) were both 1) congratulating each other for having unified biology—not just evolution, but all of biology—in the Modern Synthesis (Mayr and Provine 1980), and 2) waging a deliberate campaign to convince biologists that results from molecular comparisons that seemed to fly in the face of this Modern Synthesis were not a direct challenge, because "molecular" and "organismal" represented different "levels" of organization with different metaphysical leverages, one for addressing ultimate "why" questions, and the other for mechanistic "how" questions (Dietrich 1998). Darwinism 2.0 survived due to our willingness to embrace a vapid new catechism: molecular evolution is different (but we still have one theory). This is the process of reconciliation at work, and as you can see, sometimes the result is a steaming pile of offal. Thus, the second premise of The Curious Disconnect is that, in the absence of a rigorous reconciliation of "disconnects", what we got instead is just a muddled, non-rigorous reconciliation. As this process continued decade after decade, we got bogged down in the muck. The last "Synthesis" we'll ever need, or want? Importantly, when I refer above to The Wrong Turn, I do not mean merely that a weak theory emerged with enthusiastic support. That might have been easy to fix-- by simply discarding the theory later-- had it not been for a more subtle shift by which we came to believe that our discipline required a single formalism to encompass everything we do and to provide all the answers to The Big Questions of evolution. We decided that, in order to be legitimate, we had to have an "ism". One indication that we feel this way is that every few years, one of my colleagues notices that we've outgrown our ism, leaving some embarrassing bits exposed, and proposes to remedy this by calling for a "Newer" or "Extended" Synthesis, or calling on us to "finish" The Unfinished Synthesis. Not only do these proposals imply that 1) we used to have a comprehensive synthesis, and 2) such a synthesis continues to be possible and desirable, they also tend to suggest 3) the next synthesis really is here already, and just needs to be acknowledged. I disagree with all of this, for reasons that I'll explain in subsequent posts. For now, I just want to note that this doctrine of monotheorism is an anchor weighing us down. It sets an unachievable standard. It leads us to be embarrassed about the "disconnects" that we have, and to imagine that one new "synthesis" paper is going to set things right again, as though we already have agreed on a new set of answers and all it takes is for someone to state them out loud. Contradictions, conflicts and "disconnects" are inevitable. The healthy approach to them is not to pretend that they don't exist, or shouldn't exist, but to confront them, beginning with the process of developing deep awareness. So, I'm not going to propose another "synthesis". My primary goal is to raise awareness of problems and to achieve intellectual clarity, not to propose solutions. Once we are aware of the problems, we might all agree on the answers, but I doubt that the answers will be so obvious. This posting is just an introduction. I've tried to make three points. The first point is that there are deep "disconnects" or problems in the structure of evolutionary thought that have persisted for decades. Some of these diconnects relate to the role of variation in evolution. The second point is that decades of attempts to rationalize conflicts and rescue decrepit doctrines and prop up the reputations of dead authorities have left us bogged down in confusion. This is not because the scientific issues are necessarily hard (though in some cases they are). Its because of the baggage we are carrying. The third point is that a key part of this baggage is the belief that at every point in time all our work has to be subsumed by one great theory that is central to our identity as a discipline. I hope to convince you to reject this way of thinking. The realization that there are major problems to be solved ought to be exhilarating, not embarrassing. In my view, we should be starting a dialog, not calling for a resolution as though the problems were known and the answers were obvious. So, when we wade into the "curious disconnect", we are going to be up our ears in muck that has accumulated for generations. But, we are not going to get bogged down, because we understand the nature of the problem and we aren't going to solve it all at once. We got into this mess primarily by a kind of shallow historical conservatism, preserving old doctrines and old ideas at the expense of conceptual rigor. To get out of this mess, we have to believe that, in science, its better to be clear than to be right. Our rule is going to be "if in doubt, toss it out". For instance, I truly believe that evolutionary theory would be better off if we all stopped invoking "random" and "constraint", immediately, today. "Random" is a constant source of confusion due to evolutionary biologists who are wedded to the doctrine "mutation is random" but who aren't committed to using a standard meaning of "random", and who simply devise a special definition to rescue this doctrine. And we'll go further in this vein in Are there "mathematical" and "verbal" theories? 1. This origin-fixation framework rose to prominence in the context of "molecular evolution" and the Neutral Theory, but can be traced back to the early work of geneticists such as TH Morgan. 2. For the sake of simplicity, I'm leaving out the theory originally known as "neo-Darwinism", which we could think of as "Darwinism 1.2". This view, championed by Wallace and Weismann, preceded the Modern Synthesis as well as many early discoveries of genetics, and it particularly emphasized the abundance and universality of infinitesimal variation. While Darwin's original view included acquired effects (a la Lamarck) and direct effects (a la Buffon), neo-Darwinism had only the mechanism of infinitesimal variation plus selection, which was the core of Darwin's theory and his most distinctive contribution. Dietrich, M. R. 1998. Paradox and persuasion: negotiating the place of molecular evolution within evolutionary biology. J Hist Biol 31:85-111. Hull, D. L. 2002. History of Evolutionary Thought. Pp. E7-E16 in M. Pagel, ed. Encyclopedia of Evolution. Oxford University Press, New York. Mayr, E., and W. B. Provine. 1980. The Evolutionary Synthesis: Perspectives on the Unification of Biology. Pp. 487. Harvard University Press, Cambridge, Mass. Orr, H. A. 2002. The population genetics of adaptation: the adaptation of DNA sequences. Evolution Int J Org Evolution 56:1317-1330. Stoltzfus, A. 1999. On the possibility of constructive neutral evolution. J Mol Evol 49:169-181. Vrba, E. S., and N. Eldredge. 1984. Individuals, hierarchies and processes: towards a more complete evolutionary theory. Paleobiology 10:146-171. Yampolsky, L. Y., and A. Stoltzfus. 2001. Bias in the introduction of variation as an orienting factor in evolution. Evol Dev 3:73-83. Reading this I am catching a whiff of burning straw on the breeze so I don't agree, yet. I've got to admit though, I'm pretty excited to read the upcoming installments which look to be good food for thought. This should be interesting (settles down with bag of popcorn). I've often thought that we don't have sufficient vocabulary to handle the concepts of evolution. I suspect that we don't have sufficient maths either. Perhaps it would be a good idea to include a glossary of terms on the molevol site to avoid lots of misunderstandings in debate? Esp. excited for constructive neutral evol. When we learned about it in class (did I just betray my location there? ), most of the class went "WTF?! ", and I had this feeling of "Yes! That's it!" and eventually ended up reading popgen papers for that very reason! The neutral reality of evolution is just so much more exciting and interesting than the "It was adaptive because..." stories. Those stories just show how the feature could have been possible, but we already know it's possible because we SEE it! Sorry, that was 1999 J Mol Evol, not Mol Biol Evol. Someday I'll stop mixing them up...maybe. This is great. It's a bit over my head but I'll definitely make the effort to understand what you're saying. Are there any good sources for background information? This is a very promising beginning to a conversation that evolutionary biology has needed to have for a very long time. Particularly interesting to me is your mention of my good friend, Will Provine, who co-authored the definitive history of the "modern synthesis" with Ernst Mayr. What only a few good friends of Will know is that this partnership almost collapsed as the result of Will questioning some of Mayr's most definitive statements. Mayr suggested that Will edit his own book, and being a pragmatist, Will kept his reservations to himself. I think one of the subtexts of this first installment is that all too many evolutionary biologists have taken the same "safe" route. We have seen the clouds on the horizon and pretended that they don't exist and that everything will simply go along the way it always has. This is particularly ironic in a field that began with a revolutionary and extremely upsetting departure from the status quo. "I have visited this site and got lots of information than other site visited before a month.